Stiflers of innovation, patent trolls use overbroad patents based on dated technology to threaten litigation and bring infringement suits against inventors. Trolls, also known as nonpracticing entities (NPEs), typically do not produce products or services but are in the business of litigation. They lie in wait for someone to create a process or product that has some relationship to the patent held by the troll, and then they pounce with threats and lawsuits. The cost to the economy is staggering. 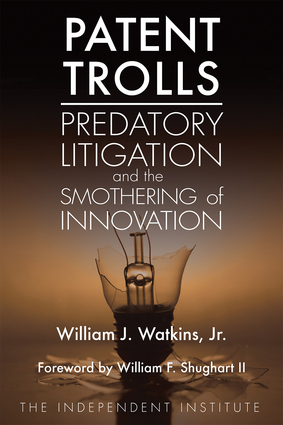 In Patent Trolls: Predatory Litigation and the Smothering of Innovation, William J. Watkins, Jr., calls attention to this problem and the challenges it poses to maintaining a robust rate of technological progress. After describing recent trends and efforts to “tame the trolls,” Watkins focuses on ground zero in patent litigation—the Eastern District of Texas, where a combination of factors makes this the lawsuit venue of choice for strategically minded patent trolls. He also examines a more fundamental problem: an outmoded patent system that is wholly ill suited for the modern economy. Finally, he examines proposals for reforming the U.S. patent system, which was created to spur innovation but today is having the opposite effect. If legal reformers heed the analyses and proposals presented in this book, the prospects for crafting a legal environment that promotes innovation are favorable. William J. Watkins Jr. is an attorney and a research fellow at the Independent Institute. He is a former law clerk to Judge William B. Traxler, Jr., of the U.S. Court of Appeals for the Fourth Circuit and a former Assistant United States Attorney. His books include Judicial Monarchs: The Case for Restoring Popular Sovereignty in the United States and Reclaiming the American Revolution: The Kentucky and Virginia Resolutions and Their Legacy. He lives in Greenville, South Carolina. William F. Shughart II is a research director and senior fellow at the Independent Institute and the J. Fish Smith Professor in Public Choice in the Jon M. Huntsman School of Business at Utah State University. He is a former president of the Southern Economic Association, economist at the Federal Trade Commission, and professor at George Mason University, Clemson University, the University of Mississippi, and the University of Arizona. He is the editor in chief of Public Choice and the author of Antitrust Policy and Interest-Group Politics, The Organization of Industry, and Taxing Choice: The Predatory Politics of Fiscal Discrimination. He lives in Logan, Utah.